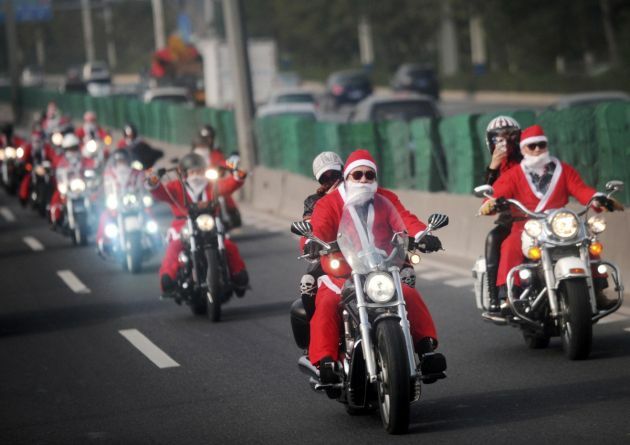 (Photo: REUTERS / Stringer)Owners of Harley-Davidson motorcycles wearing Santa Claus costumes ride along a street to give presents to elders at a nursing home during a promotional event celebrating Christmas in Guangzhou, Guangdong province December 24, 2014. Christmas is not a traditional festival in officially atheist China but is growing in popularity, especially in more metropolitan areas where young people go out to celebrate, give gifts and decorate their homes. A city in the east of China has banned all Christmas activities in schools and kindergartens in an effort to reverse an obsession with Western festivals a municipal official has said, whilst a univeristy in the north has put restictions on yuletide celebrations. Wenzhou in Zhejiang Province said the decision is meant to guide schools in highlighting China's traditional festivals, China's State-run Xinhua News Agency reported on December 25. "No middle school, primary school or kindergarten may hold any Christmas-themed activity or celebration," said the circular issued by the city's educational authority. It noted there would be inspections on the enforcement. The purpose of the Christmas ban is not to crack down on all Western festivals, but to reverse the schools' obsession with Western festivals at the expense of Chinese ones, said Zheng Shangzhong of the city's educational bureau. Schools have more of an obligation to tell children the meaning of traditional festivals such as the Lantern Festival, Dragon Boat Festival and Lunar New Year, he said, Xinhua reported. Celebrating Christmas has become trendy among young Chinese, who see the Christian festival as a merry time to shop, party and dine with their friends. Christmas is not a traditional festival in officially atheist China but its popularity has grown recently in bigger urban centers where young people celebrate by going out, giving gifts and hanging decorations. At the same time, proponents of traditional Chinese culture have warned against cultural invasion reported Xinhua. The Modern College at Northwest University in Shaanxi Province reportedly kept its students from joining Christmas celebrations by having them watch traditional cultural films on Christmas Eve. The State-run newspaper, Beijing News, said the college located in Xi'an, north western China, hung banners around the campus. They read, "Strive to be outstanding sons and daughters of China, oppose kitsch western holidays" and "Resist the expansion of western culture." A student told the newspaper about punishment if they did not attend a compulsory three-hour screening of propaganda films, which other students said included one about Confucius, with teachers standing guard to stop people leaving, Reuters news agency reported. An official blog belonging to one of the university's Communist party committees posted comments calling for students not to "fawn on foreigners" and pay more attention to China's holidays, such as the Spring Festival.